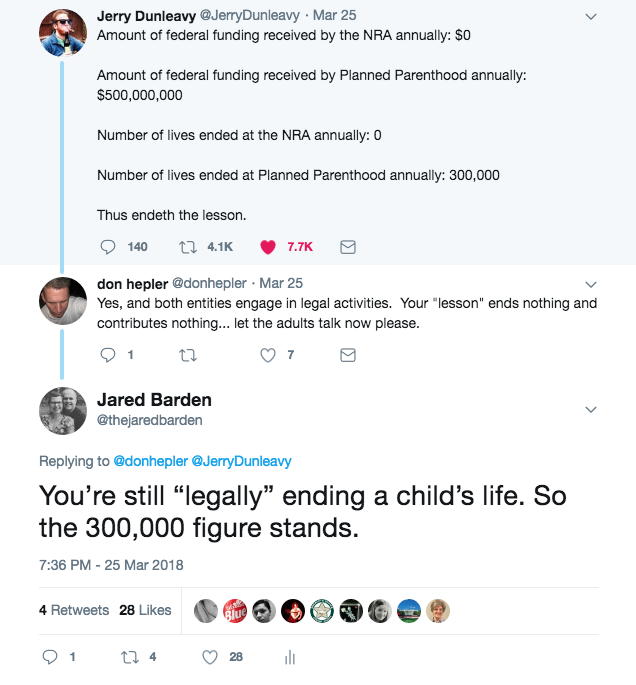 Somehow the other day I found a Twitter thread regarding the NRA and Planned Parenthood. I think it came up because someone I follow liked it. (just checked, and indeed it did). Rather than tell the whole story, I’ll just provide an image of the exchange. The topic of abortion really gets my blood boiling, and I just don’t understand some of the pro-choice arguments. As I’m sure those on the pro-choice side wouldn’t understand my arguments and point of view. 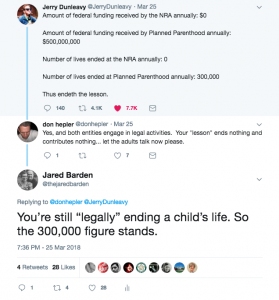 And yes, I know, Planned Parenthood funding isn’t allowed to go towards abortions, but that doesn’t change the fact they are one of the largest providers of abortions in the US. Also, I’ve found when debating and disagreeing online, name calling doesn’t help make your point. At all.